The Military has given a detailed breakdown of its role and responsibilities in the 2019 general election. 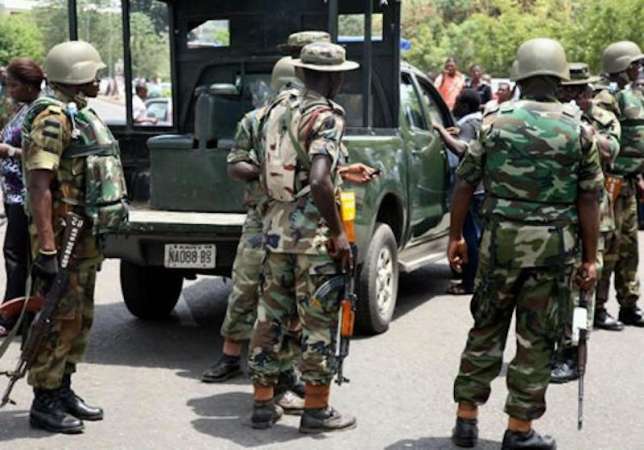 It has also reiterated that the Armed Forces of Nigeria will carry out its constitutional duties with zero tolerance to unprofessional conduct, adding that no military personnel are expected to fraternize with any political parties and associations. The Acting Director of Defence Information, Brigadier General John Agim, in a press briefing in Abuja on Thursday, pointed out that while it is pertinent to state that military personnel have the right to perform their civic duty to vote as enshrined in the Constitution of the Federal Republic of Nigeria, they must approach their polling units in mufti, devoid of any military force. According to him, “In a few days’ time the nation will be conducting the Presidential election and elections into other key political offices in the country. It is on this note that the Armed Forces of Nigeria wishes to re-affirm its neutrality, impartiality and strict adherence to professional code of conduct before, during and after the general election. “Therefore, we would like to reiterate that the Armed Forces of Nigeria will carry out its constitutional duties with zero tolerance to unprofessional conduct. No military personnel are expected to fraternize with any political parties and associations. “While it is pertinent to state that military personnel have the right to perform their civic duty to vote as enshrined in the Constitution of the Federal Republic of Nigeria, they must approach their polling units in mufti, devoid of any military accoutrement. Any military personnel who is not on essential duty that is found on military uniform on election day will be arrested and face the full wrath of military justice system. “Let me emphatically state that the Defence Headquarters has warned that all Officers, Soldiers, Ratings, Airmen and Women of the Nigerian Armed Forces must remain neutral and exhibit exceptional professionalism before, during and after the upcoming elections. To this end, with the exception of those on essential duties, no military personnel should be found wearing uniform on the elections’ days. “Also, I want to re-assure the general public that the on-going Exercise EGWU EKE III (Exercise PYTHON DANCE III) and other similar exercises in various parts of the nation are not targeted at any particular set of people or groups nor is it aimed at manipulating the electoral process. The exercises are to ensure that all eligible citizens, irrespective of their religion or political inclinations, are given the opportunity to carry out their civic right to vote and be voted for in a peaceful environment devoid of violence and intimidation by criminal elements. “These actions became necessary in view of threats from some unpatriotic individuals and dissident groups to stop people in some parts of the country from casting their votes on elections days. “Let the public be re-assured that no persons or group of person have the right to deny or intimidate eligible voters from performing their constitutional obligations. Therefore, all efforts of the military are to assist other security agencies to ensure that no Nigerian is disenfranchised. “The Defence Headquarters wishes to sound a note of warning to any persons or group of person that tries to constitute themselves into nuisance and disturb public peace on election days. Anyone found disrupting public peace will be dealt with in accordance with the laws of the land. “Furthermore, all military Commanders have been tasked to ensure adequate security in their Areas of Responsibility. They have also been further directed to ensure the adherence to code of conduct and rules of engagement in the discharge of their duties. “These assigned tasks include arrest of anyone in military uniform who is not on essential duty on those days. Likewise, any civilian caught in military uniform will be treated as a terrorist. Already the military is inundated with the allegations of illegal importation of military equipment and uniforms into the country which is being investigated. “Similarly, there is credible intelligence report that some people are planning to scuttle free and fair election in some parts of the country. The Defence Headquarters wishes to warn such group of people to desist from such unpatriotic act. We would like to caution that anyone caught, be they serving or retired military personnel, or civilians, no matter how highly placed will be arrested and treated in accordance with the extant laws of the land. The Armed Forces of Nigeria is prepared to support the civil authority in ensuring the conduct of free, fair and credible elections by providing security support services when requested by appropriate civil authorities in line with our constitutional roles.